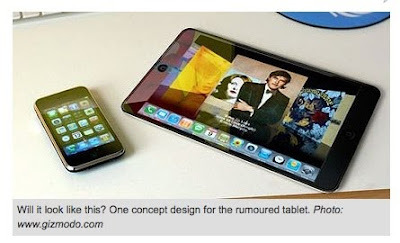 P E O P L E P O I N T S: Apple tablet looks like it is ready for prime time? Apple tablet looks like it is ready for prime time? Speculation that the Apple tablet is coming early next year is heating up. See for example this useful tour to its potential from the Sydney Morning Herald, here. The device itself looks typical Apple cool; however, more importantly, as the piece notes, there is a lot of speculation that Apple is way down the track talkng to content providers, from newspapers, to music and movie studios, and ebook publishers. The SMH piece also reports that in contrast to the Amazon/Kindle who are looking for 70% of the revenue, Apple is reported to be looking for the opposite - i.e. 30% to them - 70% to the providor/developer. This seems a huge discrepancy in business case, but again, it's a useful indicator that the legendary 'new business models' for creatives is starting to come into view. Nothing to say yet as to whether this will be a 3G or WIFI play, or both. As I speculated at the time of the Telecom XT launch, here, I still think there is a huge opportunity for local lead 3G on-deck content plays from the likes of Telecom XT and/or Vodafone. However, whoever calls this, I would bet the bank there will be some kind of Apple DRM as well. And given Apple's hard nose reputation for a deal, you can also guarantee that the main thing that is holding things up is getting the partner price ratios right, and that the specs are sitting waiting for manufacture? Another dream run for Apple? There have been a few false dawns, but for me this seems like another big breakthrough product for Apple. As for the content deals - bring them on - I'll pay - just make it resonable.